We head into week three - Lingerie Week - with eight contestants left. It's taken me a while to get this episode up, but we've had a house full of visitors for the past week. Two weeks into the competition there are a couple of sewers who are already standing out. 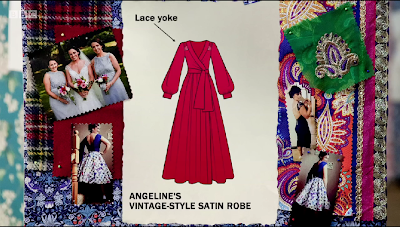 Angeline has done well in the Made to Measure challenges and won garment of the week twice, but has not performed as well in the Pattern and Alteration challenges. Joyce and Charlotte seem to be really competent sewers, with good skills all round, and Jamie has performed really well. 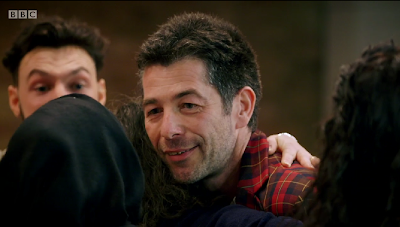 Josh seems to have scraped through the first two weeks by the skin of his teeth, and I'd be surprised to see him remain much longer. 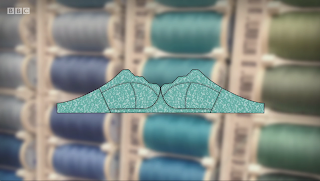 Sew a soft-cup bra (techniques include cutting itty-bitty pattern pieces accurately, sewing with stretch lace, sewing with lingerie accessories including picot elastic, clear elastic, and slides and fasteners) in 3 hours 15 minutes. My favourite fabric choices this week were Charlotte's combination of black and hot pink, Joyce's dark purple with a sheer underlay, Rumana's plain black, and Jamie's navy blue and black combination. I liked the colour of Jade's lace, but it seemed to be very textured and lumpy, which didn't appeal to me. I wasn't very keen on the wishy-washy blues that Angeline and Tracey chose, but Josh took the prize for bad fabric choices with his awful orange lace. I noticed that several contestants are not great at accurately pinning and cutting their patterns. They either don't get the fabric neat and straight (Josh in particular), or they don't weight or pin properly, pull the fabric when they are cutting, or allow the fabric to slip around. If you don't cut straight, correct size pieces, you're never going to get a good finished product. 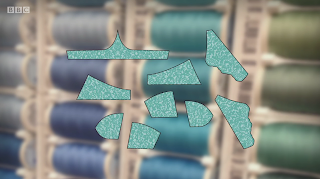 Jade seemed baffled about how the tiny pattern pieces would ever end up being a bra, and Jamie complained about his "meaty hands" working with such a fiddly pattern. Jade wasn't sure whether to press the seam allowance, but gave it a go and ended up stretching her bra out. Josh struggled with the clear elastic and three step zig-zag stitch. Tracey's bra ended up too big (maybe uneven cutting) and stuck out weirdly on the front bottom edge, Jade's looked uneven with one cup sitting lower than the other. Rumana barely finished her bra, and ended up with one twisted strap, and the other strap fell apart during the judging. Angeline seemed to struggle the most, and ended up with an unfinished bra. The judges gave their most positive comments on Charlotte (loved the colour combination, neatly sewn, hugging the dress form, picot edge just showing, but small tuck in back fastening), Joyce (seams well matched, picot even, back fastening perfect, flawless job), and Rumana (sits nicely on dress form, picot well sewn, back even & neat, but one strap was twisted, and the other fell apart). Their most negative comments were on Jade (not symmetrical, gaping at the front, lace stretched out, back fastening not matching up), Josh (little bit untidy, seams lumpy, strap twisted), and Angeline (long way from finished, straps not properly put together, back fastening not done). 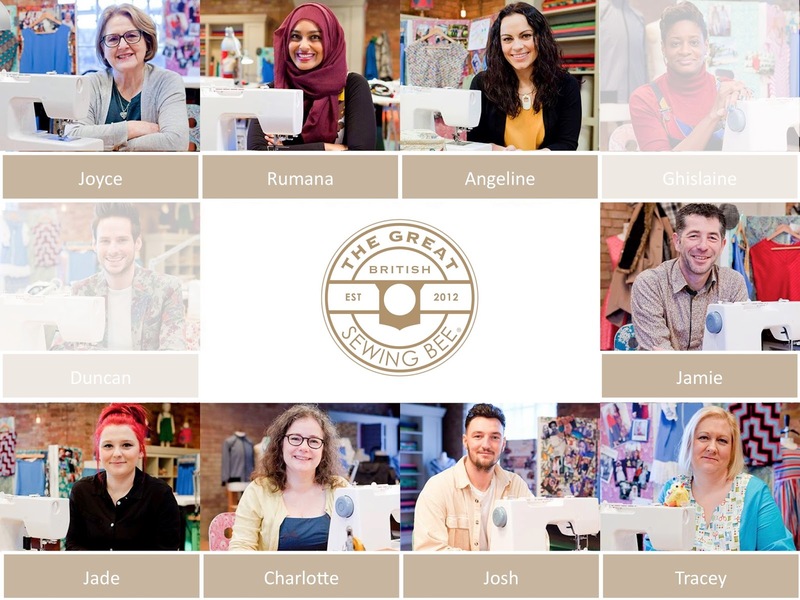 The results from 8th place are Angeline, Josh, Jade, Rumana, Jamie, Tracey, with Charlotte in second (beautifully made but with a tiny tuck in the back), and Joyce in first (an immaculate bra). This was no simple make, and I was really impressed with how contestants coped. Take three scarves in silky fabric and turn them into a piece of lingerie in 1 hour 30 minutes. 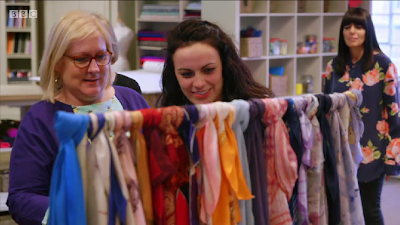 The contestants were each allowed to select three scarves. 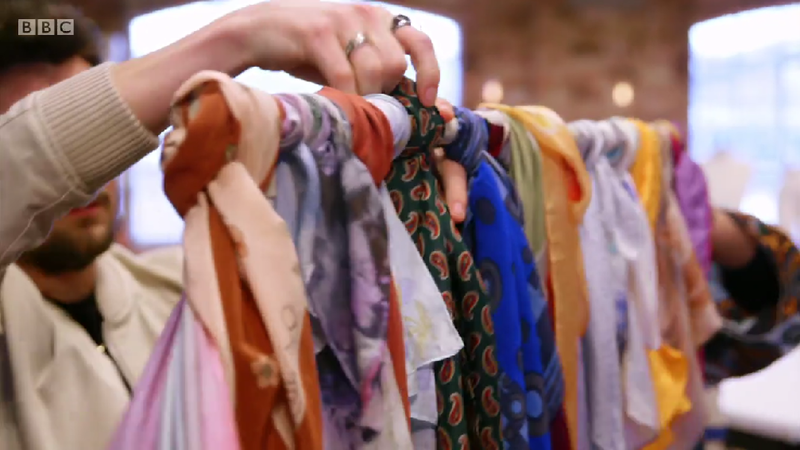 They were all different sizes, colours, patterns and fabrics. Some were silk and floaty, and some were sheer. Lots of contestants chose to make a nightdress or slip. Jamie was the only one to go for something significantly different by making some ladies boxers. I really liked the scarves chosen by Angeline (one dark blue, and the other a white and blue floral), Charlotte (one geometric diamond print, and the other a white and green pattern that matched really well), Rumana (pretty floral pastels, and Tracey chose one of my favourite scarves (a pretty white and blue floral). Charlotte and Angeline seemed to have a good plan straight away. They both made triangular bust sections, and attahced a gathered skirt. Charlotte did a really pretty double strap that crossed over in the back. Angeline did something similar, but used lace in her straps, and ended up with a gathering of fabric, lace and fabric flower at the back. Rumana had a really pretty idea, with a twisted front and pleated back, but she made it too large, and it ended up with a flap of fabric hanging at the back. Tracy did a really pretty slip design, however I wasn't a fan of the godets she inserted. I really didn't like either of the boys makes this week. Jamie's shorts were really ugly, and not well finished, and Josh's slip/nightie/thing? was just awful. The fabric choice was dreadful, and I don't even know what it was supposed to be. The judges gave their most positive comments on Charlotte (cute back with crossover straps, good use of geometric pattern on scarf, not stretched), Tracey (good use of fabric, used edge of scarf cleverly, well thought out), Joyce (good combination of fabrics, well thought out, even sewing), and Angeline (colours well chosen, used hem of scarf, fits well). 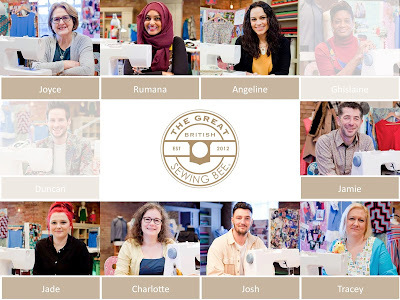 Their most negative comments were on Josh (odd selection of fabrics, not sure what it was supposed to be), Rumana (front was successful, but large flap of fabric at back, didn't fit mannequin), and Jamie (shirring elastic not a good choice, hem awful). The results from 8th place are Josh (not sure what the hell it was), Rumana, Jamie, Jade, charlotte, Angeline, in second was Joyce (nicely made, works very well), and in first place was Tracey (great piece of work). Sew a robe in a luxurious fabric to fit a real model in 6 hours. Contestants had a mix of male and female models for this challenge. The fabrics this week were so much prettier than last week's Showstopper. Jade chose a lovely black and white geometric print, Angeline chose a gorgeous red silk with a red lace for the shoulders, Charlotte had a really nice green and blue cotton lawn (my all time favourite fabric choice), and Rumana had an interesting selection of red lace laid over black silky fabric. I liked the simple kimono style robes chosen by Charlotte and Rumana, and the simple menswear robe chosen by Jade and Jamie. Angeline had my favourite pattern choice. It looked like something you'd see a 1950's movie star swishing about in. 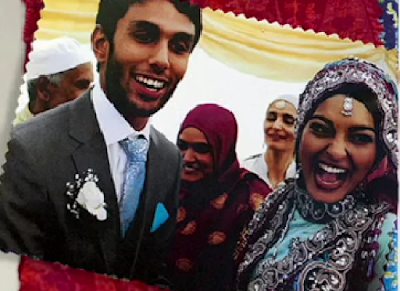 By the way, has anyone else noticed in the closeups of the contestants pin boards, the gorgeous photo of Rumana on her wedding day? 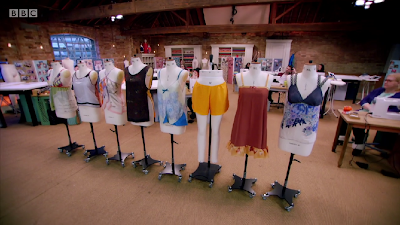 The judges gave their most positive comments on Charlotte (good choice of fabric, good fit, hand sewing is exquisite, delicacy and lightness to it), Jade (loved the choice of fabrics, length good, pattern matching on pockets spot on, Patrick even said "I'd wear it. "), Angeline (very glamorous, very different, lace well handled, well thought through), Rumana (nice combination of fabrics, hangs nicely, looks elegant), and Josh (liked fabric choice, collar sits nicely, cuffs even but pocket was on wrong side and there was a little puckering in shoulders). Their most negative comments were on Jamie (under collar collapsing and falling out, gathers in sleeve and shoulders, cuffs uneven, no pockets). I couldn't help noticing that Tracey got a very good review, however, the judges didn't comment on her dreadful bust darts. They ended somewhere on the upper bust, and both had a really noticeable dimple in the end. They clearly hadn't been sewn all the way off the end of the dart. 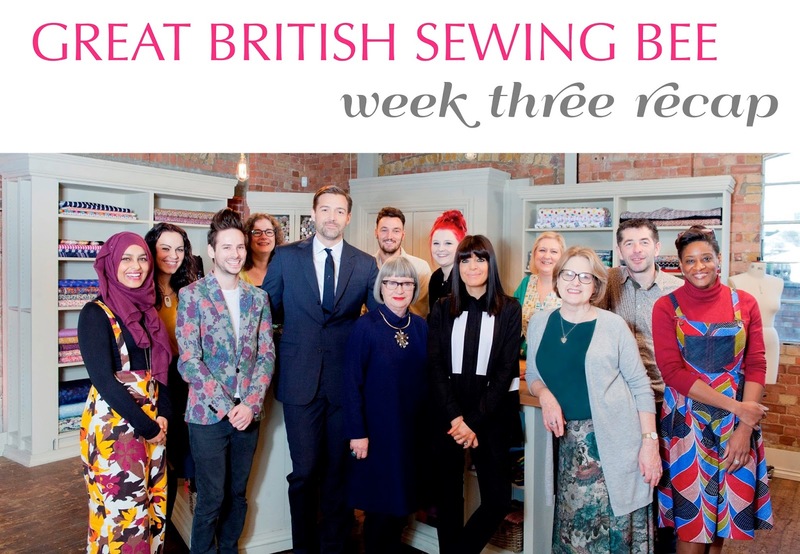 The judges felt that Angeline and Rumana had done more than enough to keep themselves in the competition with their Made to Measure challenge. 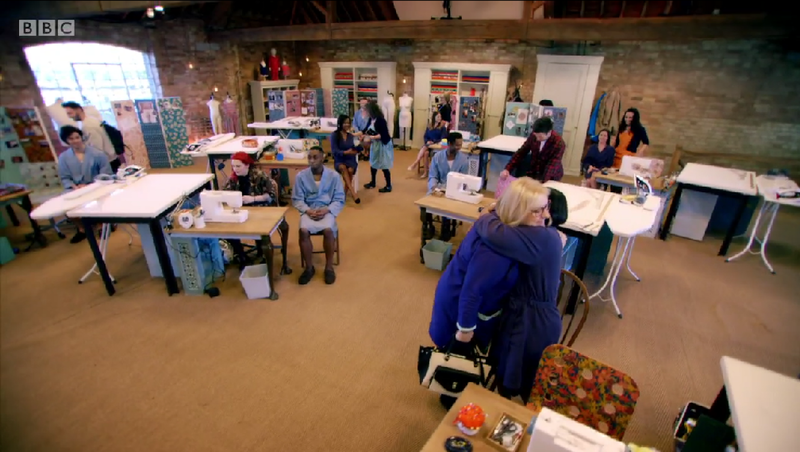 Josh - alteration challenge was "a dogs dinner", made to measure gown had minor errors. Jamie - alteration was better than Josh but not great, made many mistakes in his made to measure gown. 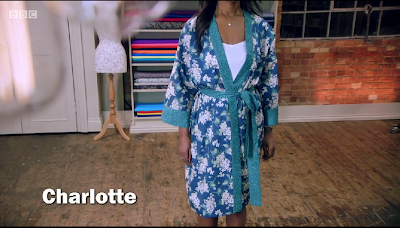 Garment of the week went to … Charlotte for her dressing gown. The contestant leaving this week was … Jamie. Check out the look of shock and relief on Josh's face. 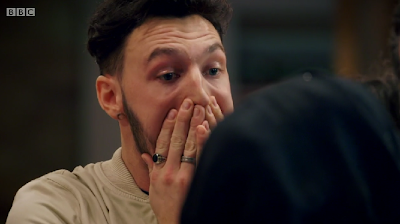 I honestly thought Jamie would make it through to the final. He did so well in the first two weeks, and seemed to have excellent skills. He performed poorly in the first two challenges, but it was his disastrous dressing gown that sealed his elimination. Next week is International Week. 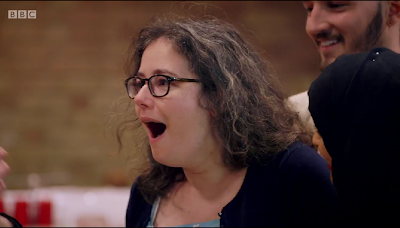 The teaser showed contestants struggling with a cheongsam/qipao shirt in the Pattern challenge, using a sari in the Alteration challenge, and making west african dresses in the Made to Measure challenge. It looks like another interesting week, and I can't wait to the next episode. The Fold Line - have a list of all contestants and links to their blogs, website and social media. They have also reviewed the new GBSB Season 4 book. By Hand London - Elisalex De Castro Peake has reviewed by new GBSB Season 4 book. Can anyone tell me which was the pattern Angeline used? (as in, brand and ref. number?) I want to make myself one, but even after I searched for a long time on the interwebs I can't find it! Please help me! I mean the robe pattern, just in case that wasn't clear. I had a look at the episode, and her pattern pieces were hand drawn. She may have drafted the pattern herself. You could Google how to draft a Kimono. If you're after a commercial pattern, Simplicity 5839 is a similar looking robe.